Firefox has discontinued the support for legacy extensions in version 57. Although I don't maintain this extension for years, I know that many of you have used this extension until it's last days and I want to thank you for all your support. Mozilla will disable and remove all legacy add-ons from Firefox's addons pages by early October 2018. Search and browse Google, Yahoo, Ask, MSN and other search engines and sites directly from your browser toolbar with this FREE utility. 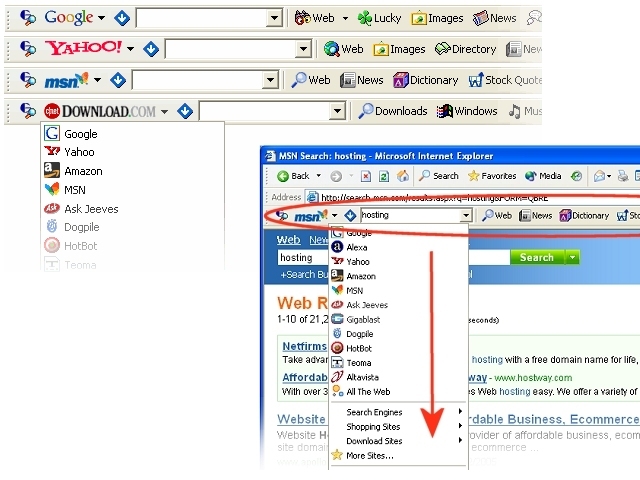 Just like you have installed Google toolbar for Firefox or IE or Yahoo companion, Groowe Search Toolbar is customized for each search engine included in the list so with each engine you will have unique experience. You will be able to perform all kind of searches that some engine supports, for example image search, audio search, video search etc. Toolbar is available for Internet Explorer and Firefox. "I can’t recommend Groowe enough. One toolbar, so many search engines and functionality. I love it!" If you can't find what you are looking for on one search engine, you can easily perform the same search on another search engine from the list. On that way you spend less time searching for web pages on different engines, and more time looking at them. Groowe Search Toolbar also allows you to browse site's categories or directories and helps you to find wanted category or directory quick and easy. Toolbar doesn't support just search engines, you will also be able to search jobs, tags and bookmarks, downloads and shopping sites. Requirements: Windows 95/98/Me/NT4/2000/XP, Internet Explorer 5 or higher OR Firefox 1.0+.